Women don’t want to work out when it feels like a chore. The secret to faster weight loss results is to take the hard work out of your exercise. How? By making exercise fun and social. Enroll in Zumba Fitness or Group Groove and upgrade your workout while having fun. When you have fun you exercise with more consistency. 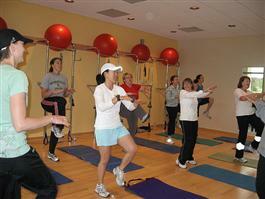 Zumba Fitness in Canton, MA is the fun way of burn those extra calories. Women love this cardio dance party because it targets abs, arms, glutes, and legs with easy-to-follow dance moves. There is another dance exercise option too: Group Groove in Canton, MA. This exercise class offers another approach to a dancing exercise and cardio workout where you will also have lots of fun and sweat a ton. Both of these dance exercise classes work perfect for women and men who want to just feel good and young again while expressing themselves and sweating all the stress out of their system. The biggest advantages is you will reach your physical fitness target with your friends who share the same interest. Plus, you become more comfortable and confident with your body after every class. To live a happier and healthier life, visit the Answer is Fitness.